I've had a Peloton bike at home for a couple of years and love it. If you're not familiar, Peloton sells very high quality spin bikes with a 23" tablet mounted so you can enjoy live/on-demand studio style spin classes from home. The bike runs ~$2,000 and the monthly subscription is $39. It's not a cheap purchase but definitely worth it in my opinion. We've had zero issues with our bike and the quality/production of the classes (filmed in their NYC studio) is excellent. Peloton just announced a partnership where participating Westin hotels will make Peloton bikes available in their fitness centers and in-room. This is pretty awesome. I figured Peloton would partner with hotels eventually but never considered they would make bikes available in-room! Given the "Peloton hospitality" branding on the site, I have a feeling Westin is not the last partnership for Peloton. I'd highly recommend checking out Peloton next time you're staying at one of the participating properties. I would definitely go out of my way to book a participating property knowing that there would be a bike available in the fitness center or in-room. I'm curious how they are going to manage shoes for these bikes - is it BYOS or will they make them available in the fitness center? Has anyone stayed had a participating Westin and experienced Peloton yet? 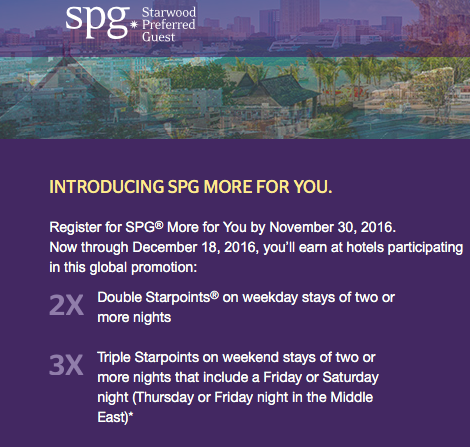 SPG's latest promotion didn't seem to be especially rewarding on the surface. I clearly wasn't doing the math right as I had a qualifying stay last weekend that ended up earning me a ton of points. The promotion offers 2x Starpoints on weekday stays of 2+ nights and 3x Starpoints on weekend stays of 2+ nights. Our 2 night weekend stay at the Westin Riverfront Beavercreek fell into the latter category. Beyond that, this was my final (of 3) stays of a targeted promotion I received earlier in the year. For two nights with tax, meals, valet parking, resort fees, and dog fees our total spend was $814. I had an Amex offer for Westin which reduced that by $50. So how many points did I earn on $677 of eligible spend? That's a whopping 8,239 SPG points on $764 in spend or 10.8 SPG points per dollar spent (or 32.4 Marriott points per dollar spent!). 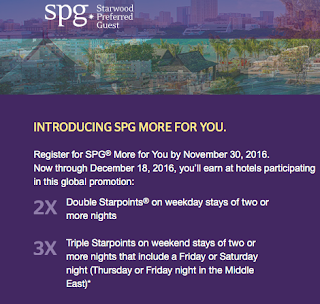 I value SPG points at around 2.5 cents so that's a return of 27%! We're currently in the Colorado mountains for the weekend staying at the Westin Riverfront Resort & Spa which is located in Avon at the base of Beaver Creek. This is a great property and we've stayed here a number of times both in the winter and in the summer. It is an easy drive from Denver (<2 hours with no traffic) and there is plenty to do on property and around town. I'll have have more details to come in the future but just wanted to point out at this resort offers Westin's "Make a Green Choice" program where they provide resort vouchers/SPG points in lieu of housekeeping. We took advantage of this promotion for the first time in Toronto were they offered 500 points to forego getting our room cleaned. Note that you have to stay a minimum of two nights to take advantage of this promotion. 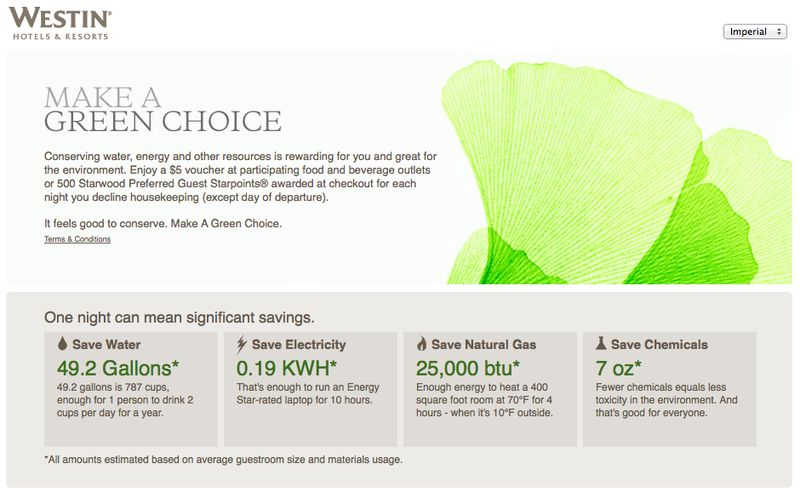 Here, the offer is increased to 1,000 SPG points (which I value at around $30) given their commitment to sustainability. Free points, not having to worry about returning to someone cleaning the room, and saving the environment - I can definitely get on board with that. This is really a great offer and something that we are taking advantage of and will during future stays as well. How Many SPG Points Can You Earn From One Stay? A couple of weekends ago, we went to Toronto for the weekend. The original plan was to stay at the Westin with Cash & Points. But I found a great deal and changed the reservation to a cash rate of $264 USD for the entire stay. 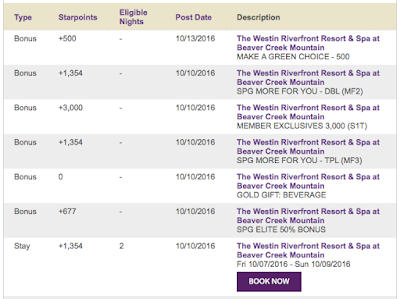 So in total, I earned 2,395 SPG points for my 2 night stay. I value SPG points at $.03 each so that's a "rebate" of $72. I also earned 558 Chase Ultimate Rewards points which I value at $.02 each so that's an additional $11. All in, I earned a "rebate" of $83 on $279 in spend. The combination of savvy choices, (Green Choice) elite status, and leveraging the right credit card and hotel promotion can really add up! 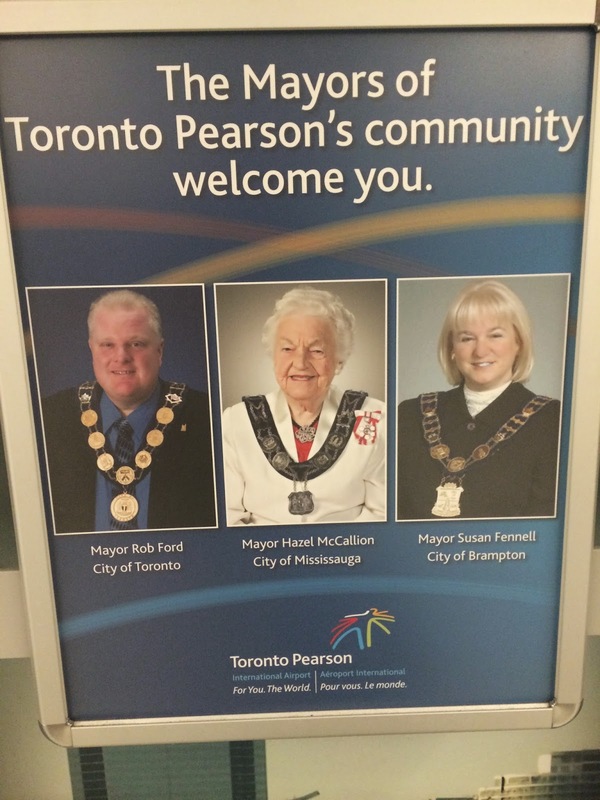 We just returned from our weekend in Toronto. The weekend was awesome and we had a great time exploring the city. 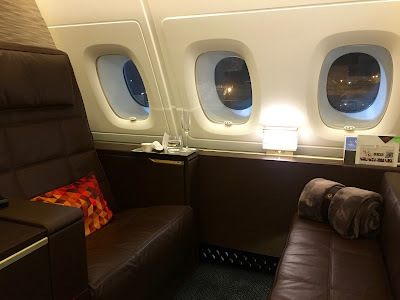 Here's my consolidated (flights, hotel, city, concert, lounge) review of the weekend. Enjoy! We left downtown Denver around 3:15PM for our 5:40PM departure. Traffic was light and thanks to TSA Precheck we were at lounge 5280 (the best spot for a drink at DEN - located in terminal B) enjoying a pre-flight cocktail. We made our way to the gate and were quickly on our way to Toronto. If you are ever on a United CRJ-700 and have access to Economy Plus, definitely pick row 7. The "bulkhead" separating the seat from first class is a "curtain" so you have essentially unlimited leg room. We landed in Toronto around 11PM and parked at a remote gate. So we had quite the hike (seriously it took us almost 20 minutes) to get to immigration. I've always found entering Canada to be pretty comical. I have made over a dozen trips over the last seven years yet always get interrogated upon arrival. I think that is the standard treatment but who knows...maybe they think I'm super dangerous. About once a month, I "garden" my upcoming hotel and flight reservations. What does that mean? I check the out to make sure nothing has changed or if there is anything I can to make them better. The most common scenario is an airline schedule change which causes an early morning wake up call, a late departure, or a missed connection. In those cases, finding out about the schedule change prior to departure enables me to either accept the change (with United, you can do this online) or call and request a different flight/connection, etc...because the airlines made the change on purpose (vs. weather, mechanical, etc...) they are FAR more likely to allow you to change your reservation to something better. But this can be a great strategy with hotel reservations as well. 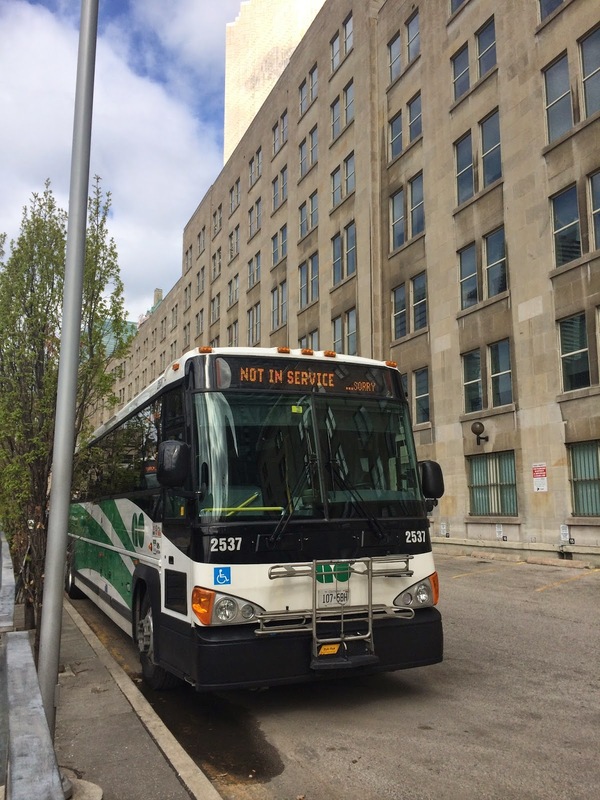 A few months ago, I posted about our weekend trip to Toronto which is now just a couple of weeks away. This morning, I checked on our hotel reservation and discovered that the hotel was actually running a promotion the weekend of our stay. The cash rate had dropped from $252 to $132 per night AI. Originally, I had booked using cash and points so the stay would have cost me 10,000 points and $150 for both nights. So now, I could spend an additional $110 cash and save the 10,000 points. Since I value the Starwood points at roughly $300, that is a big win...I will definitely put them to good use in the future! I cancelled the current reservation and rebooked the new one in about 10 minutes. It doesn't take a ton of time to do this especially if you only travel periodically. But it is definitely worth the time to ensure that everything goes smoothly and/or you're getting the most value out of your miles/points/cash! Emily and I are both pretty big Avicii fans. After a couple of failed attempts last year, we wanted to make sure we caught him on the upcoming North American tour. There are only 7 shows and most of them are on Thursday or Sunday nights. We both have limited vacation days so needed to make one of the Saturday night shows work. Our options were DC, New York, or Toronto and Toronto worked best. Emily hasn't been and I've spent limited time there so we decided to make a weekend out of it. Not to mention, we get to go stamp collecting. Flights were running over $700/person so I checked out our award ticket options. This is a situation where points and miles can enable experiences not previously possible. I was able to grab two nonstop economy tickets on United for the outbound for 25,000 miles $5.00 leaving after work on Friday. Paid economy tickets on United weren't terrible coming back from Toronto on Sunday afternoon so I paid for those with cash. The show is at the Rogers Centre downtown. There were several great hotel options but we decided on the Westin Harbour Castle which is a short 15 minute week from the venue. 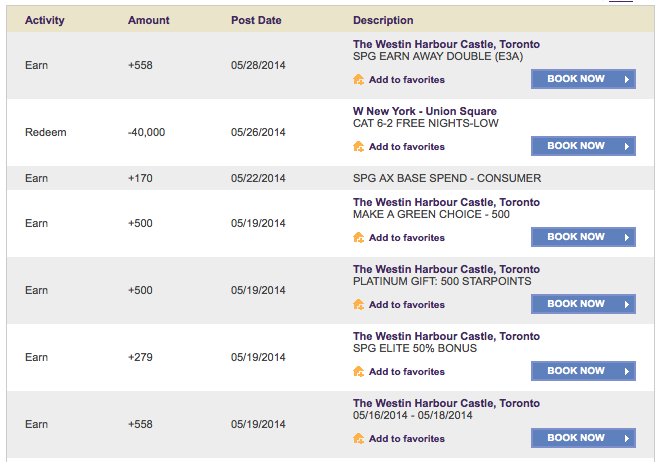 Starwood is great in that paid, points, and cash and points stays all count towards elite status. So this trip, I'll pick up 1 stay and 2 nights towards re-qualifying for Platinum status. Paid rates were going for $252 AI per night. Points (10,000) and cash and points (5,000 + $75) were both available. So I could either use points and receive 2.52 cents/point. Or use cash and points and get 3.54 cents/point. I opted for the latter and we were all set. I find that SPG cash and points redemptions usually deliver the most value and 3.5+ cents/point is really, really good value. I've heard the weather in Toronto in May is pretty good. If anyone has been there and has suggestions for stuff to do/places to eat, please comment below.